Manipulating the shape of electoral districts to determine the outcome of an election is called gerrymandering. One method is to manipulate the number of people in each district so that "your" supporters end up with more districts, and your opponents end up with less. Basically, you spread out your supporters so that they get a greater voice than their numbers warrant. Generally, states are allowed to draw districts that deviate from the ideal size by 10%, one district can be 5% below, and another can be 5% above the ideal size for a 10% maximum deviation. The Republicans have been able to retain their decades-long hold on the Senate -- and the Democrats the Assembly -- by the use of such techniques. In the New York State Senate, a district is supposed to have 306,072 people in it. This figure is the state population divided by the number of districts. According to the one person one vote principle, if each district has this 306,072 population, then each resident will have the same electoral power as residents elsewhere in the state. Note that Long Island and District 39 are yellow, with just the right amount of constituents. 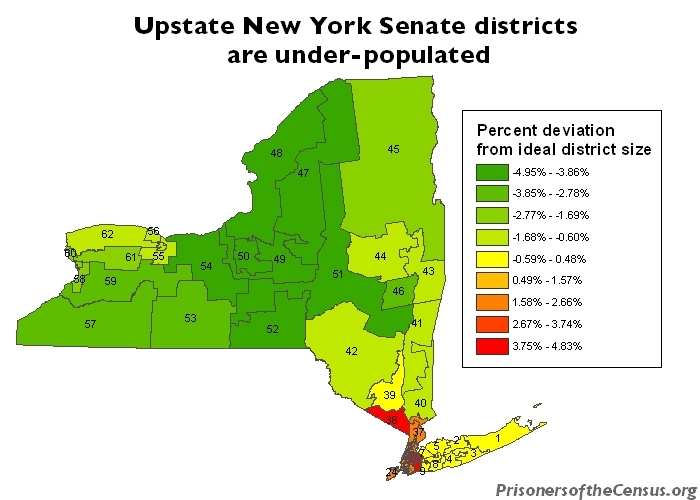 The upstate districts, with just a few exceptions, are all shades of green indicating that the districts are all short of the required population. All of the Senate districts in New York City are shades of red or orange, indicating that each was drawn to include too many people. In Bronx, Manhattan, Brooklyn and Staten Island, each district has 5,186 to 5,191 too many people. It's as if the New York Senate said, "We want a vote in New York City to be worth 1.69% or 1.70% less than the average voter in the state." In a fair redistricting, some districts will deviate a little from population equality in order to preserve communities of interest, meaning that allowing a small population inequality is acceptable it can mean avoiding splitting a distinct community in half. But here, where all 4 boroughs were devalued exactly the same amount, the intent of the Senate to preserve distinct communities is questionable. In the Queens portion of New York City (in red), the situation is more extreme. 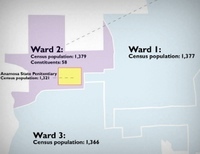 Each district in Queens has 318,481 to 318,484 people. With a variation of only 3 people, each district in Queens has about 12,410 too many people. Now it's as if the Senate said that Queens residents are worth 4.05% or 4.06% less than the average resident of the State. Typically, although this rule appears to be changing in cases of deliberate geographic vote dilution, size deviations under 10% -- (5% below and 5% above the average) -- are considered to be insufficient to violate the 14th Amendment and the One Person One Vote principle. The New York Senate drew the lines for Queens to approach but not cross -- or so they thought -- this line. However, the data relied upon by the New York Senate was faulty. Despite a command from the New York State Constitution that "no person shall be deemed to have gained or lost a residence, by reason of his presence or absence ... while confined in any public prison", the Senate relied upon federal Census data to draw their lines. The Federal Census does not apply the New York Constitution, instead counting prisoners as if their residences were in rural prisons. 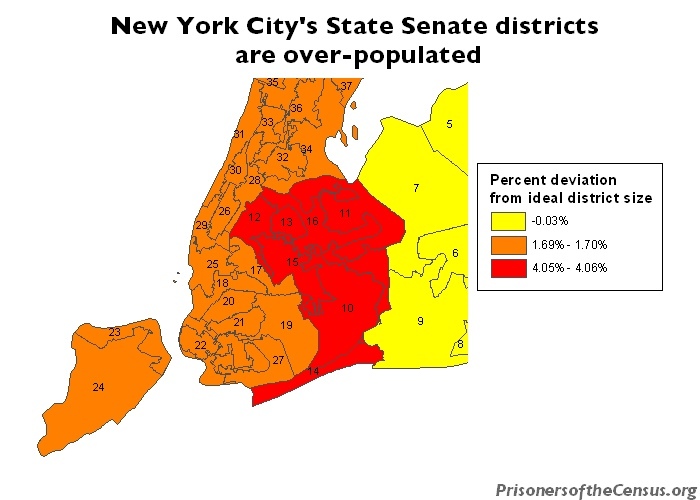 Although prisoners are probably highly concentrated from the poorest communities of New York City, we might assume that New York City's prisoners are evenly distributed throughout the City, or 1,800 from each state Senate district. At the very least, it's likely that at least one of the Queens districts is like this "average", and it's certainly a better assumption that counting the prisoners in rural prisons. Adding 1,800 prisoners to the already too-populous Queens districts, raises the districts deviation to 4.4% too many people. 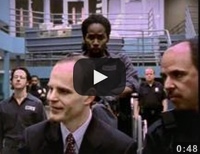 But who got credited with the prisoners, if not in Queens? 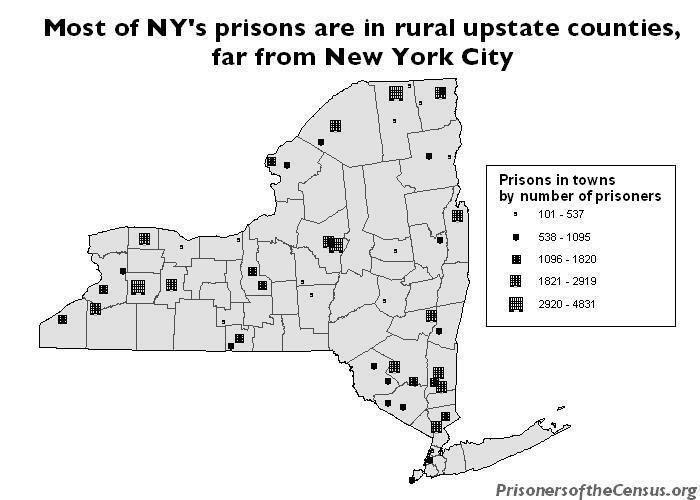 As the next map shows, almost all of the state's prisons are in the upstate region. 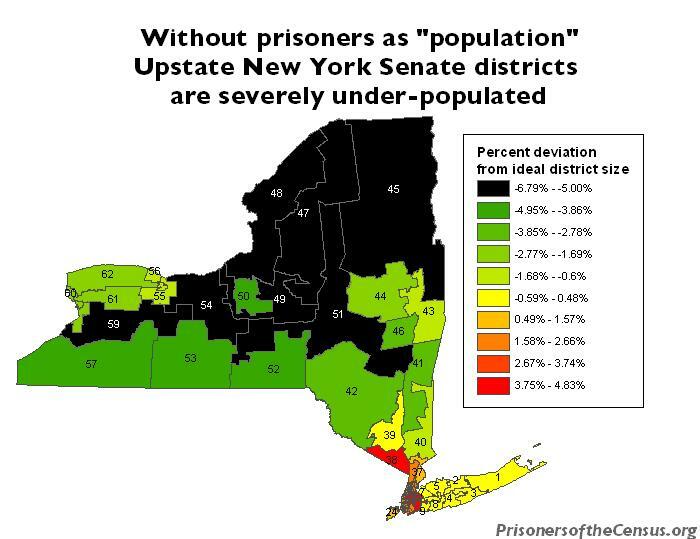 In fact, a third of upstate's population growth in the 1990s was a result of prison expansion. If the inert ballast shoring up rural counties -- Census enumeration of prisoners -- was removed, 7 Senate districts would be more than 5% too small. These combined deviations exceed the 10% discretion typically allowed states in their redistricting. Where prisoners are counted makes enough of a difference on district size to trigger this important test of vote dilution. But this numerical exercise may not even be necessary. An argument can easily be made that counting urban prisoners as rural residents violates the very idea of starting with population and deviating from perfect equality only to preserve traditional "communities of interest". 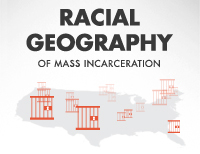 Prisoners are external populations that are not "traditionally" rural in any sense of the word. Allowing communities to take in populations by force, just to benefit in the state legislature, violates any sense of equal protection or fundamental fairness. As Chief Justice Warren instructed in Reynolds v. Sims, laying down the principle of one person one vote: "Legislators represent people, not trees or acres. Legislators are elected by voters, not farms or cities." Nor, we might add, should they be elected by the presence of a prison.